*This blog post is sponsored. I received a sample of the product to test. Even though I received a sample, this does not effect my review. This blog post contains affiliate links. I have been testing this Levoit Elora Natural Himalayan Crystal Salt Lamp: Stainless Steel Base, Touch Brightness Dimmable Control for over a week and I love it. 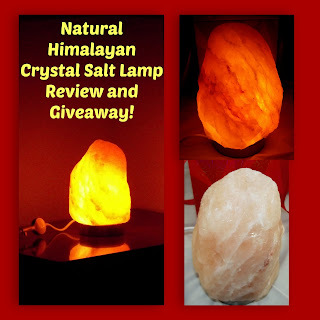 I received this salt lamp from Levoit Elora to test and give one away! For giveaway info scroll to bottom of page. First, it came beautifully packaged in a red holographic box with easy to carry ribbon handles. Most salt lamps I have received come in standard packaging. This one would be great to give as a gift as is. It is also packaged with Styrofoam on top for protection and an easy to open plastic bag. This salt lamp is very pretty on or off. It has a 6.5 FT cord. It also comes with an extra bulb. The dimmable switch is touch controlled. The touch control can take a couple of times to get used to. The lamp puts off a soft glow that makes a perfect night light. This does get a little warm but salt lamps do. It will also sweat some so its recommended to put a place mat under it. The stainless steel base is nice and different. This lamp is easy to clean. Just take a damp cloth and gentle wipe. I personally love to sit and watch this lamp. I find it very relaxing to look at. *They are said to help with allergies, asthma and breathing. *NOTE: these are just claims in general that I have read and found. Overall this is a very nice Himalayan Crystal Salt Lamp that I recommend to anyone looking for one. Its very pretty and durable. I can see it lasting a long time. You can find it HERE on Amazon. I love how they help with allergies, since I have a ton! I love all the health benefits! My favorite would be relieving stress and anxiety. Thanks for this blog post. It helps to explain the uses and benefits of salt lamps. I love the look of the stainless steel base against the salt block. As I am one who suffers from respiratory problems I love that these lamps naturally pull harmful contaminants and allergens out of the air so you can breathe easier. Thanks for this chance. I have been curious about these for awhile now! I love it helps releave anxiety and stress. I truly love Salt Lamps, and all of their benefits! This one is so gorgeous!! I suffer from allergies and asthma but my daughter will need it more. It would be great to have this. Not only are they aesthetically pleasing but seem to have health benefits as well. Definitely interested in purchasing a few to see if they work. I didn't know how beneficial these lamps can be. They're also very stylish. I would like it to help with anxiety. This blog makes me want to try a salt lamp so bad! Three of my children as well as my husband suffer from allergies and my one son has asthma! Awesome, I have been really wanting one of these. I would love this. Definately need it for the stress and anxiety! I really think my household would benefit from one of these salt lamps. Thanks for the chance to win one of these cool looking lamps. I've always heard about them and seen them at a few select stores, but this one looks to be of really high quality. I also like that the light has a dimmer light to switch too. Looking forward to this! I have been hearing so much about these lamps and would love to win one! The benefits the lamp provides and the awesome look of it makes it even more desirable! Thank you for offering it! Hi thank you so much for this opportunity I have been really wanting one of these lamps. Good luck everyone!! I love the look of the lamp. It's really pretty, I have heard about these and hope to get one someday. It's a nice soft light. Thanks for a chance... Love the natural benefits of salt lamps.. I love how this lamp has different levels of light and stainless steel base. A couple if great benefits. I would love to have one of these. My stress levels are so high, and Im tired of taking medications. These salt lamps are great! I love the different light levels and the peacefulness it emits. Not only is it beautiful but it helps with allergies! I love the way this one looks and the healthy benefits this offers. It's beautiful! The health benefits would be a nice relief from my allergies, too. I love that it helps out with stress. I love all the health benefits the salt lamp has and it helps with allergies and I am allergic to most everything . Besides changing the bulb looks so simple and easy and looks like a Christmas light bulb! I want to win. I like that it is a natural air purifier. I never even knew about this. How awesome. I really want one now. I like that it can help with allergies. My mom has one of these in her house and she loves all the natural benefits from using this! I didn't realize we could benefit so much from a lamp like this. I've really wanted to try one of these for awhile! They're so beautiful, and I love the fact that they help with so many things, especially insomnia and stress. Thanks for a great giveaway! I love the stainless steel base. Very unique. I also love the pretty soft glow that the salt lamp has. I love that they are supposed to help with sleep and would love to test it on my insomnia. Ive been wanting one! Ive recently been looking into them. I qould love to keep one in my bedroom to help me slewp better. Wow I would love to try one! I love the way they look as well as the health benefits. I like that Himalayan Crystal Salt Lamps help to purify the air. That would be very beneficial with my seasonal allergies. I like how many benefits there are! I would really like to win this!! Its so unquie!thank you for the chance to win! The quality they have that means the most to me is that they help with allergies. My husband suffers and I would love to ease his symptoms. Oh my! Always wanted one of these! My Mother had one of these, and I've always wanted one.